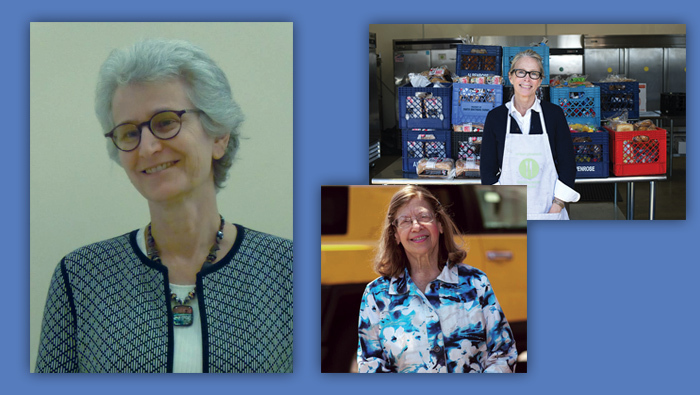 The 2017 Joshua Stampfer Community Enrichment Award will honor three women who have made outstanding contributions to the Jewish community and the Portland community at large. Those women are Dr. Jill Ginsberg, Tracy Oseran and Sharon Strauss, each of whom represents social justice at its finest. The Stampfer Community Enrichment Award was created in 1990 to honor Rabbi Joshua Stampfer on the 50th anniversary of his ordination. The purpose of the award is to honor individuals or organizations that have enriched Jewish culture, education and community with the dedication exemplified by Rabbi Stampfer. This year’s honorees are well known in Portland for their vigorous work in the field of tikkun olam (social justice). They feed the hungry, care for the needy and take care of the homeless. Each, in her own way, has created an agency to meet the many needs of the less fortunate in our community. Dr. Jill Ginsberg is the medical director and founding physician partner of the North by Northeast Community Health Center, which opened in 2006. The center is a free and low-cost clinic serving the under-respected and underserved. Dr. Ginsberg has been active in the pursuit of social justice for many years, including serving as Social Action chair at Congregation Beth Israel. From 2001-2007, she served on the Commission of Social Action of Reform Judaism, which helps set public policy for the Reform movement’s 900 congregations. She was a family physician with Northwest Permanente from 1994-2012. Jill has been the recipient of numerous awards and honors, including the 2011 Oregon Women of Achievement Award and the 2008 Bank of America Neighborhood Excellence Initiative Local Hero Award. Tracy Oseran is the founder and executive director of Urban Gleaners. Founded in 2006, Urban Gleaners’ mission is to help alleviate hunger by rescuing edible surplus food that would otherwise be thrown away and delivering it to agencies that feed the hungry. The concept of picking up and redistributing food is a simple weapon in the fight against hunger. Urban Gleaners distributes food from more than 40 sites in Portland, including school-based pantries through the Food to Schools program, and Mobile Markets, which are open to anyone who needs food. They also deliver food to other hunger relief organizations. Urban Gleaners relies on the services of more than 65 volunteers to help deliver the goods. Sharon Straus is the founder and director of the Sunshine Pantry, a family-run food bank located in Beaverton. What started as a Cub Scout canned food drive project for her oldest son more than 25 years ago rapidly developed into an agency that is committed to providing essential nutrition and amenities to those in need. Striving to restore dignity and instill hope, the pantry’s main focus is the family. As Sharon has stated, “In the hours of crisis, we believe no child should go to bed hungry.” Sunshine Pantry currently supplies food, toiletries and clothing to more than 500 families a month. Among her honors and awards, Sharon has received the Governor’s Volunteer Award for Outstanding Lifetime Volunteer Achievement, and the KATU Hero Award, both in 2009. Art will tickle all your senses at the 11th annual Celebration of Art at the Mittleman Jewish Community Center the last weekend in October. Admission s free to both events. ORA Northwest Jewish Artists returns to the MJCC for their 11th annual art sale. The art extravaganza kicks off Saturday evening, Oct. 28, with the Taste of Art preview party and sale from 7 to 9:30 pm. The fun continues all day Sunday (10:30 am-4:30 pm) with the Celebration of Art sale. Affordable, original, high-quality fine art created by local Jewish artists will be available. Live music and tastings from local food and drink vendors will round out both events. Glass, ceramics, fabric, beads, stone, paint, metals and photography from local artists will spark your senses with a selection of beautiful Judaica and a variety of secular art. Most participating artists will happily discuss commission ideas. The preview evening also showcases some phenomenal local “food artists” who will be handing out samples: Sake’One, Stone Barn Brandyworks and Love Bites from Carne Wilson and Tiffany Miller. Guests will be treated to the sounds of a local three-piece jazz trio: Andres Moreno on drums, Jon Lakey on bass and Wyck Malloy on tenor saxophone. At the Sunday celebration, music and food again accompany the art experience. Music by Rich Garber, George Fendel and Tom Roth will be heard throughout the day. Food artists will again offer tastings: The Portland Bloody Mary Mix, Portland Juice Company, Stellar Pops and Love Bites. Cafe at the J will offer a special meal; all art purchasers will receive a coupon for a discount at the cafe. All art purchases also include raffle tickets toward a seven-day getaway. Portland Hadassah presents Our Heritage and Our Health, 12:30-2:30 pm, Oct. 15 at the Mittleman Jewish Community Center. Learning about your heritage is a beginning. All around the world distinct ethnic groups have been identified as having increased risks for particular genetic diseases. In the Ashkenazi Jewish population, several such inherited diseases are known. These include Gaucher disease, cystic fibrosis, Canavan disease, Bloom syndrome and others. Gaucher disease is the most common Jewish genetic disorder. Among Ashkenazi Jews, 1 person in 15 is a carrier for this disease and 1 in 850 have Gaucher disease. Learn more at this complimentary presentation by Gary S. Frohlich, MS, CGC senior patient education liaison. The event is free, but RSVP is mandatory for the lunch catered by Century Catering. RSVP to diana2504@msn.com.